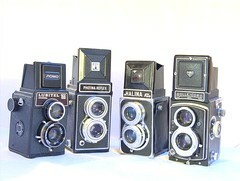 For a list of TLR cameras, see TLR category. TLR stands for Twin Lens Reflex. The camera uses two lenses of equal focal length, one for viewing and focusing and the other for taking the photograph; reflex refers to the mirror used behind the viewing lens that makes focusing possible. 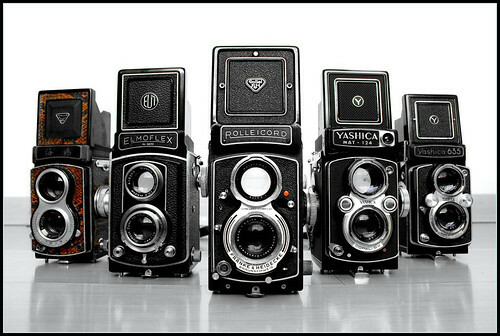 The great commercial successes among TLR designs have been the 6×6 cm designs that flourished from the 1930s to the 1950s, but TLR designs long predated these. 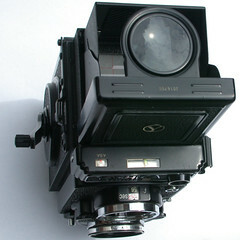 Twin Lens Reflex (TLR) cameras are "two-eyed" cameras such as the Rolleiflex or Rolleicord. They normally consist of two lenses of equal focal length and equal "speed". They are mounted one above the other in the front of the camera, and their focusing is synchronized so that they are always focused at the same distance. The difference is that the upper lens projects the incoming image via mirror up to the reflex finder's ground glass focusing screen while the lower one (the "taking" lens) projects the image into the camera's dark chamber and onto the film plane. The taking lens can be stopped down while the finder lens is always at maximum aperture. The scene viewed by the top lens is reflected by a mirror onto the ground glass screen. This is usually viewed from above, in a waist-level viewing hood. When viewed like this, the image on the screen is laterally inverted (i.e. left-right), which can take some time to get used to. This phenomenon is neither unique to nor an inevitable characteristic of TLR cameras; a waist-level finder on an SLR camera will give the same left-right reversal. Prism finders, which both correct this reversal and allow eye-level focusing, were available for some Rolleiflex and Mamiya TLR cameras. The taking lens exposes the film, usually by an in-lens leaf shutter. The small distance between the centre of the viewing lens and that of the taking lens leads to a difference in the scene each captures; this phenomenon is known as parallax error; if the subject of the photographs permit, this can be corrected by lifting the camera until the taking lens is as high as the viewing lens was when the image was composed. The earliest known TLR is one made in 1880 by R & J Beck of London for the Kew Observatory in west London. During the next twenty years, numerous camera makers included a TLR design, of course for glass plates. Franke & Heidecke's first Rolleiflex, released in 1928, was marketed as a miniature camera, taking 6×6-cm exposures on 117 film. 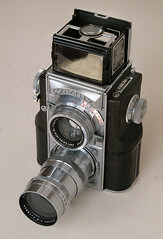 Early competitors were of similar design, but the Zeca-Flex, Superfekta and Perfekta were folding models, and among the ingenious features of Voigtländer's design for its Superb (1933) was automatic parallax correction, as the viewing lens tilted downward as the camera was focussed more closely. Zeiss introduced their first Ikoflex in 1935. The overwhelming majority of TLR cameras made have been for 6x6cm pictures on 120 (or 620) film. The Superfekta and Ontoflex make 6x9cm images on 120 film. The Mentorett introduced by Mentor Kamerafabrik Goltz & Breutmann in 1936 was unique in having a focal plane shutter instead of a leaf shutter. A number of Japanese companies brought out TLRs before World War II, but these were primarily for domestic consumption. After the war, a great number of companies made TLRs. In Japan, there were a huge number of brands through the 1950s; best-sellers include the Ricohflex and various Yashica models, while distinguished designs include the Fujicaflex and Koniflex. Franke & Heidecke continued with the Rolleiflex and Rolleicord, and Zeiss Ikon with the Ikoflex. But they were ubiquitous in other countries too. As 35mm cameras became more popular and 6×6 SLR designs became more reliable, the popularity of TLRs fell. However, Rollei (as Franke & Heidecke became) continued with the Rolleiflex (which had wide and tele versions), Yashica with its various models, and Mamiya with exchangeable-lens models culminating in the Mamiya C series. Chinese Seagull models have also continued. 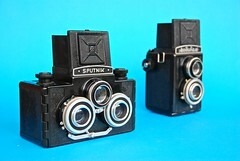 "Lomagraphists" prefer old Soviet LOMO TLRs. Zeiss Ikon introduced the 35mm Contaflex (TLR) in 1935, which took a range of interchangeable lenses. The Agfa Flexilette and Agfa Reflex also use 35mm film. The Toyoca 35 is unusual in being arranged with the lenses side-by-side. For more examples, see the Category:35mm TLR. Several makers of TLR cameras (including Rollei themselves, Yashica and Minolta) made a small model for 4cm-square pictures on 127 film. One of the attractions of these was that they can be mounted for projection as 'superslides', using mounts that will fit many 35mm slide projectors. See the Category:4x4 TLR. Photographer Peter Gowland of California made (among several other camera designs) twin-lens reflex cameras for both 4x5-inch and 8x10-inch (only 21 copies made). Gowland and other makers, including Keith and Cambo also made large-format cameras with a separate lens and bellows for focusing and composing, but without an internal mirror. Not every camera that outwardly resembles a TLR actually is one; see pseudo-TLR. TLRs are typically very quiet, as the leaf shutter is quiet and the mirror does not move as in an SLR camera. The viewfinder image matches the image size on film. There is no viewfinder blackout during exposure. Most TLRs use leaf shutters, which can synchronise with a flash at any speed. Used conventionally, TLRs are "waist-level" cameras. (In reality, they are more often chest-level.) Numerous photographers claim that subjects are usually more relaxed and less likely to strike poses for photographers using waist-level cameras. When necessary, conventional TLRs can be lifted above the head and the finder viewed from below. Parallax error is a problem at close object distances. The image is laterally reversed, if a waist-level finder is used. Unlike an SLR, no impression of depth-of-field can be given in the viewfinder, as the viewing lens has no diaphragm. Some models are heavy, most models are large for the image size. ↑ That is, what most people mean when they use the name Rolleiflex is a TLR, though the brand name was also used on both 35 mm and medium format SLR cameras. ↑ Gowlandflex cameras at Peter Gowland. Spira, S. F. The History of Photography: As Seen through the Spira Collection. New York: Aperture, 2001. ISBN 0-89381-953-0.